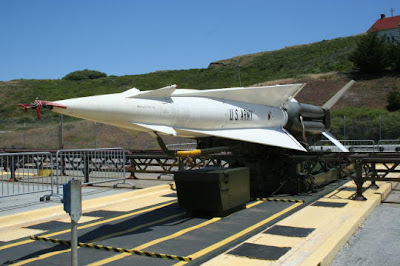 A Nike Hercules surface-to-air missile at the only restored Nike missile site in the United States. The site is in the Marin Headlands, near Sausalito, Calif. The missile could carry a nuclear warhead of up to 40 kilotons. From 1968-1971 I trained to be a technician on these missiles and worked as launcher chief at a Nike firing site. Several times a month National Guard and Army squads would come out to the middle of the New Mexico desert and fire a few of these missiles down range - it was an awesome site to behold.. you get a small glimpse of it from the video. Often I would be in the control center about 15 feet below the launch.. even the sound was amazing. Maybe I'll make it out to this museum in San Francisco some time.